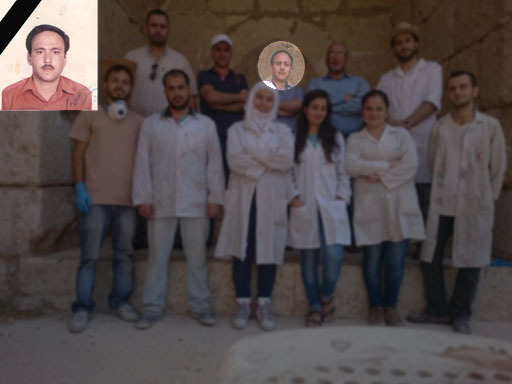 The Secretary of Heritage for Peace, Rene Teijgeler, gave a presentation at the technical meeting Syrian Cultural Heritage Initiatives, organised by the Syrian Heritage Archive Project at the Museum für Islamische Kunst and the Deutsches Archäologisches Institut on Friday, July 31 2015. The title of the presentation was Heritage for Peace: Data, Data Collecting and Database. It is with great sorrow we share the DGAM’s report that Qassem Abdallah Yeyha, a DGAM employee, was killed by a mortar round while going to work on August 12 2015. He was the Deputy Director in charge of mosaics. 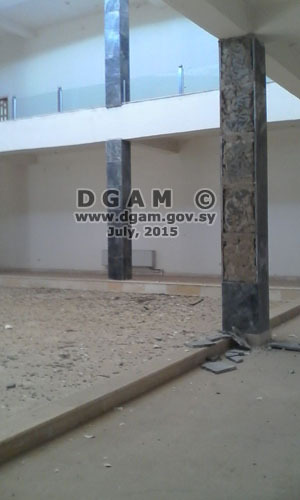 On July 30 2015 the DGAM reported further damage to the museum in Daraa. On July 29 2015, the DGAM reported that the museum building at Palmyra has been damaged by “clashes in the area”. On August 10 2015 the DGAM confirmed social media reports that the Ottoman-era Khan Assad Pasha in Marrat al-Numan has been damaged by fighting. The DGAM reported damage from an air strike to the archaeological residence at Tell Chuera (July 26 2015). Exccavated items had already been removed. New photos taken and shared by the DGAM provided an update of the status of the World Heritage Roman theatre in Bostra (July 27 2015). The Syrian-Spanish Project in the Middle Euphrates has published two open-access articles in Spanish concerning the destruction of Syrian heritage: EL CONFLICTO ARMADO EN SIRIA Y SU REPERCUSIÓN SOBRE EL PATRIMONIO CULTURAL. The first article deals with sites in the governorate of Deir Ez-Zor, the second about that of Raqqa. They are available here. An article by Al-Monitor discussed how looted items are passing through Lebanon, available here. examines fake Syrian artefacts on the black market in pictures, available here (August 5 2015). This article provides an interesting summary of the way in which ISIS may be researching their looting, discussing the so-called ‘ISIS Book Club’. In his article in Counterpunch, Franklin Lamb discusses reconstruction and repair efforts by ordinary Syrians and the DGAM (July 29, 2015). Sites discussed include Saint Mary Church of the Holy Belt (Um al-Zennar), Crac des Chevaliers, the Homs Museum, Zahrawi Palace, and Mufid al Amin House in Homs. Other sites includes Aleppo Musuem, Deir Ez Zor Museum, Hama Museum, Taybet al Imam Museum (Hama), Idlib Museum (Idlib), Shaqa Tower and Shahba pool walls (Suweida). In Damascus he visited the National Museum, the al Azem Palace, the Damascene Heritage House, the Khan Asaad Pasha, and the Nationa Museum of Science and Medicine. In addition to the reconstruction work, new security measures have been implemented at several. In addition, Franklin Lamb revisited the Tentative World Heritage Site Maloula on July 27 2015, chronicling the “efforts of the local returning villagers who are deeply connected to this cradle of civilization and who are not waiting for the end of hostilities to begin restoration and repair work of their homes and of our shared heritage sites.” This article is available here. The DGAM Director General has visited sites in NE Syria during the last two weeks of July, where he also met with local communities who have been “engaged in defending the archaeological heritage” in that area (Report here). SAFE and the Neubauer Collegium for Culture and Society provided summaries of the colloquium “The Heritage Landscape: Key Players and Current Issues“. The first part is available here, and the second part is available here. The German workshop on Friday 3rd July: “War against civilization. Does the sale of antiques promote international terrorism?” (here) does not appear to be realted to the German research project, ILLICID (here). Germany is cracking down on the illegal trade in stolen artefacts (available here). Three US Senators are working to prevent ISIS from profiting from stolen antiquities, with new measures (details here). Vitaly Naumkin, Director of the Institute of Oriental Studies at the Russian Academy of Sciences, calls for “less talk, more action” in dealing with the heritage crisis in the Middle East. Another article on how IS is making money from antiquities smuggling, from July 27 2015 by Breitbart, available here. The Smithsonian recorded efforts by academics to rescue ‘precious cultural capital’ on August 7 2015, availble here. 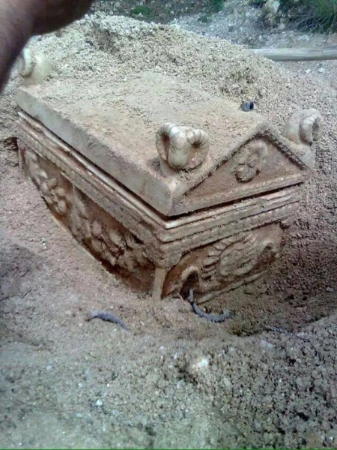 ABC Radio National provided a podcast entitled “Archaeology: Current Threats, Future Possibilities” on July 27 2015. The NewsHub asks “Why Do Islamists Despise Pre-Islamic Cultural Heritage”, available here.